Do you often find yourself hiding your mouth when speaking or taking pictures because your teeth have lost their luster? You are not alone. Tooth discoloration occurs naturally as you age. In addition, the foods and drinks you consume, poor oral hygiene, or smoking can accelerate the darkening of your enamel. To restore a bright smile, there are several whitening products and treatments that you can use, but which is best? To make the right choice, it is important to understand how each option works and the results you can expect to achieve. While there are many over-the-counter solutions, it is often better to get a professional treatment from your Lehigh Valley dentist. Now, you can find an array of whitening products as you walk down the oral health aisle at the store. They can range from toothpastes and gels to mouthrinses and strips. While they may seem like the affordable and convenient solution, they will not give you the results you want. They do not contain professional-grade whitening agents, so they cannot remove stains that are below your enamel. They can lighten surface stains, but the results usually are not drastically noticeable or lasting. 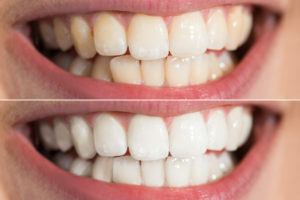 One of the most common ways to reserve tooth discoloration involves using bleaching treatments. They can improve the color of your teeth by as much as 5 to 7 shades on average. Using an active ingredient of either carbamide peroxide or hydrogen peroxide in concentrations of up to 22%, they can remove both surface stains and those that are below the enamel. Now, you have two different options using this method for teeth whitening in the Lehigh Valley: in-office or at-home kits. With an in-office treatment, a gel is applied to your teeth and a special light is used to activate the whitening agents. After just one appointment, your smile will be several shades whiter. You can also enjoy the benefits of an in-office treatment from the comfort of your own home. Your dentist will provide you with custom-fit trays and the whitening agent to used daily for about 2 weeks. Your teeth will be noticeably whiter with results that last. To find the best whitening treatment to meet your needs while giving you the results you want, it is best to schedule a consultation with your dentist. They will evaluate the health of your teeth and gums to ensure that the treatments are a safe option for you. They will take the time to discuss different solutions that accommodate your lifestyle, so you can make the right choice. Do not hide behind tooth discoloration. Get the bright, white smile you want with professional teeth whitening. Dr. S. John Salivonchik has committed his life to helping his patients achieve healthy, beautiful smiles. Due to his extensive training and qualifications in the dental field, he offers many areas of specialty, including cosmetic dentistry. He can help you get the bright smile that you have always wanted with the latest whitening treatments. Contact our office today to schedule your consultation.